ees and forests provide a habitat for many species of animals and plants. Tropical rainforests are one of the most biodiverse habitats in the world. Trees provide shade and shelter, timber for construction, fuel for cooking and heating, and fruit for food as well as having many other uses. In parts of the world, forests are shrinking as trees are cleared to increase the amount of land available for agriculture. Because of their longevity and usefulness, trees have always been revered and they play a role in many of the world's mythologies. Although "tree" is a term of common parlance, there is no universally recognised precise definition what a tree is, neither botanically nor in common language. 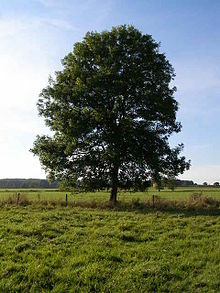 In its broadest sense, a tree is any plant with the general form of an elongated stem, or trunk, which supports the photosynthetic leaves or branches at some distance above the ground. Trees are also typically defined by height, with smaller plants being classified as shrubs, however the height which defines a tree varies widely, from 10 m to 0.5 m. By these broadest definitions, large herbaceous plants such as papaya and bananas are trees, despite not being considered as trees under more rigorous definitions. Another criterion often added to the definition of a tree is that it has a woody trunk. Such a definition excludes herbaceous trees such as bananas and papayas. Monocots such as bamboo and palms may be considered trees under such a definition. Despite being herbaceous and not undergoing secondary growth and never producing wood, palms and bamboo may produce "pseudo-wood" by lignifying cells produced through primary growth. Aside from structural definitions, trees are commonly defined by use. Trees may be defined as plants from which lumber can be produced. The groves were God's first temples.